The savvy nonprofit development professional knows that fundraising is a lot more than just writing grants or throwing events. It's cultivating individual donors, nurturing networks, building relationships, clearly communicating your mission, and motivating people toward action. It's thinking outside the box to consider new ways to attract resources; it's assuming abundance over scarcity; it's being bold and being patient, at the same time. The 2019 AFP Kentucky Conference is designed for the entire philanthropic community. Whether you're a volunteer or an executive director, a grant writer or a grant maker, an experienced development director or a new program manager – you'll find valuable learning and networking at this conference. All individuals who participate or are looking to better understand the grand task of philanthropy are encouraged to attend. We are especially excited to bring Penelope Burk to Kentucky as our Keynote Speaker. Penelope is the author of the fundraising classic, Donor-Centered Fundraising and she has just published a completely updated and substantially expanded second edition containing all-new research with donors. Penelope will share some of her amazing research findings and stories with us. 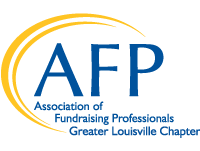 The 2019 AFP Kentucky Conference is co-hosted by the Association of Fundraising Professionals Greater Louisville and Bluegrass Chapters. The Association for Fundraising Professionals Greater Louisville and Bluegrass are official chapters of the Association of Fundraising Professionals (AFP), a nonprofit 501(c)(3) organization that represents nearly 30,000 members in more than 205 chapters throughout the world, working to advance philanthropy through education, training, mentoring, research, credentialing, and advocacy. The association fosters the development and growth of fundraising professionals and promotes high ethical standards in the fundraising profession. Ticket prices increase after April 30, so click here to purchase TODAY! The 2019 AFP Kentucky Conference presents the opportunity for organizations interested in participating to promote their mission, business, and products during this one day event. Many functions are scheduled throughout the conference that will allow for maximum exposure for participating sponsors to all conference delegates. Scheduled activities include Luncheon, Post-conference Social & Happy Hour, & dedicated sponsor space in meeting areas.